At Father Joe’s Villages, we believe in providing a stable future for our clients. Our Skills & Training Enhancement Programs (STEPs) provide practical on-the-job experience to help our neighbors like Everett find jobs in growing industries. 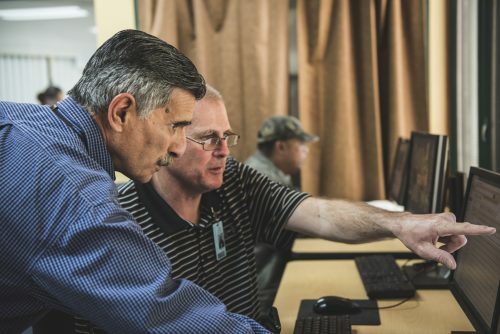 A STEPs staff member helps a Father Joe’s Villages client apply for open jobs. Everett lived with his wife and two children in Nevada where he worked as a skilled carpenter and construction worker for 13 years. He owned a small business specializing in the remodeling of restaurants, offices, homes and even custom sheds built to order. Everett was living the American dream until one day his wife blindsided him with a divorce. Shocked and devastated, Everett didn’t have the energy or will to contest the divorce. He walked away— leaving her with their home. He decided to move back to his hometown of San Diego, but once he returned he realized that most of his connections had moved on. This is how Everett found himself homeless. For a while, Everett lived out of his car but was eventually unable to pay the registration on it. Once it was repossessed, Everett’s only option was to live on the street. “The street life is not comfortable and it’s depressing. These are not friendly streets.” Through word of mouth, Everett was told about Father Joe’s Villages and he decided to put his name on the waiting list. He was able to move into the Joan Kroc Center November of 2017. Grateful for his second chance, Everett began participating in services at Father Joe’s Villages immediately. It didn’t take long for Everett to learn about Father Joe’s Villages’ Skills and Training Enhancement Programs (STEPs). STEPs provide practical on-the-job experience to help clients find jobs in growing industries. The programs offer hours of training and mentorship, guiding clients through each stage of the employment process. Everett’s first days in STEPs consisted of painting walls, which Everett couldn’t stand. He was itching to start building things again. He stuck with it, however, and always showed up to class early and stayed late. He was the first to volunteer any time help was needed. He even learned the trade of welding and how to operate a forklift. His favorite part of STEPs was the hands on experience, and his supervisor, Joe Ryan. Everett felt that Joe always listened to and supported him. Due to his background in construction, Everett was able to finish STEPs in a third of the time, making him the first ever STEPs graduate. 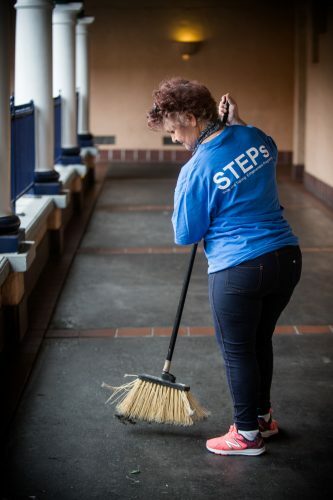 A Father Joe’s Villages STEPs participant sweeps a walkway. Even after graduating the program, Everett continued to come back to Father Joe’s Villages on a volunteer basis. “I wanted to give them a better idea of what my skills were and what my work ethic was.” Everett proved to be such an asset that Joe eventually took his supervisor aside and explained that they needed to hire Everett “before someone else does.” Everett was finally hired on full time as a 3rd level Technician. In just a little over a year and with the help of Father Joe’s Villages staff, Everett attained a career, moved into his own apartment, and bought a car. He is now a role model to others living at the Village who aspire to gain what he has. Everett is thankful for his team at Father Joe’s Villages (consisting of his Supervisor, Case Manager, Housing Navigator and Counselor) who supported him through his most difficult time. He continues to keep in contact with each of them and always share the positive news that is going on in his life.